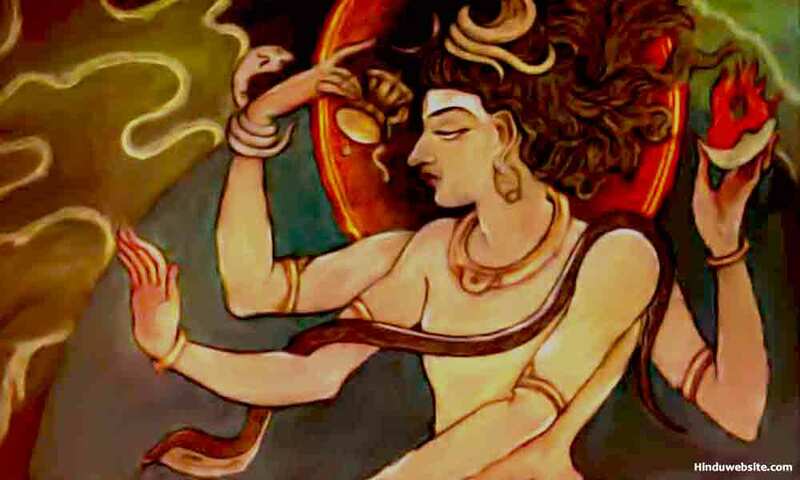 This essay explains complex unique nature of Shiva, the auspicious god of Hinduism and why he does not easily fit into our conventional norms and notions. In mainstream Hinduism, Shiva is worshipped as the destroyer, whereas in Shaivism he is considered Brahman himself and worshipped as Isvara, Maheswara or Parameswara (the great lord). All other gods and goddesses of Hinduism are considered his aspects or emanations. He is also regarded as the source of all in his supreme aspect, who performs five distinct functions in creation as the creator, preserver, concealer, revealer and destroyer. These five functions or manifestations are considered his pancanana (pentad) forms or aspects or aspects of Sadashiva, the eternally auspicious supreme being. Therefore, he is often depicted in the iconography as a deity with five heads, each facing a different direction. You will also find Shivlingas with five heads adorning the upper part. In the Yantras or the diagrams which are used in Tantric rituals and meditative practice the same concept is graphically shown as a pentad with a dot or a reverse triangle in the center. The dot represents pure consciousness and the pentad and the reverse triangle stand for Prakriti or Parvathi, who is the dynamic force of Shiva and who performs those five functions under his will. The two are also often shown together as a star with two triangles in opposite directions. It represents their union or creation itself. 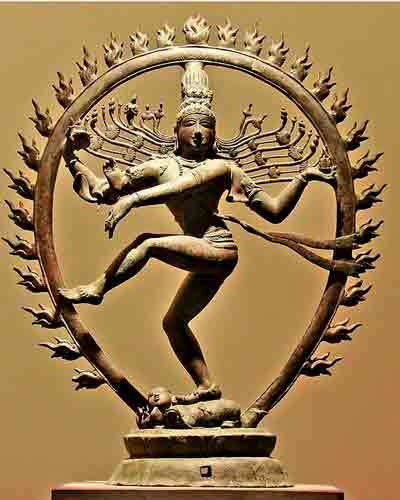 He is also often portrayed as Nataraja, the Lord of the Dance, surrounded by a circle of fire. Both life and death are symbolically associated with his universal dance. Life and death are the two faces of creation. Life is inherent in death and death is inherent in life. Both are separated by the movement of Time, the devourer, preserver and creator of all. Death opens the portals of rebirth, renewal and resurrection while life opens the possibilities of death, impermanence and destruction. All these are made possible by the inviolable will of Shiva. Shiva is also the jiva, the living being, who is a reflection or projection of himself in the field of Nature. Therefore, the individual will of human beings is but the will of Shiva only. If they use it for selfish and egoistic purposes, they incur sin and suffer from rebirth and other existential problems. If they use it in the name of Shiva and for the sake of Shiva as an offering, they are exonerated from all consequences. Hence, in Shaivism, the emphasis is more upon becoming Shiva through identification, meditation, devotion, worship, service and self-absorption. Shiva is the only deity in the Hindu pantheon, whose forms and formless aspects are worshipped ritually and spiritually. In case of other gods and goddesses, devotees usually worship their images, idols and symbols. Their invisible aspect is rarely invoked or worshipped. However, in case of Shiva, devotees worship his images as well as his subtle (linga) form. The Shiva Lingam represents his formless(nirakara) or subtle (sukshma) aspect. When you worship Shiva Lingam, you worship but formless, unmanifested (avyakta) and indistinguishable (nirguna) Shiva. People may worship Shiva along with other gods. However, the Puranas clearly state that Shiva cannot be realized except through single-minded devotion (ekanta bhakti). It is further said that devotion to Shiva arises due to the blessings or approval (anugraha) of Shiva only. Devotion to Shiva acts as the seed. Sravana (hearing), kirtanam (singing) and mananam (remembering) are the important devotional practices by which devotion becomes strong. Through several births and rebirths and Sadhana (practice) one finally attains perfection on the path and attains liberation or the pure state of Shiva (shivapad). The worship of Shiva through service, devotion, meditation, yoga and other approaches are the means to earn Shiva’s approval and attain that state. They constitute Shiva Yoga, and the perfection one attains by it is known as Shiva Yoga Siddhi. Shiva’s head is the source of all knowledge and intelligence. The Celestial River Ganga, which descends from his head is the purifying, uplifting, energizing and liberating consciousness or divine knowledge. Whoever attains and becomes soaked in it become Shivam, the enlightened auspicious pure being. The strands of his matter hair represent different streams of knowledge, energy and consciousness. His trident (trishul) represents the power that destroys the triple obstacles to liberation and enlightenment namely egoism (anava), attachments (pasa) and delusion (moha). His damru awakens the lost souls and opens their minds to the possibilities of an eternal life. Shiva personifies all the divinity, duality and opposites that exists in the universe. He is both the Self and the not-self, the god and the goddess, consciousness and energy. He has both pure and impure aspects. He is Shiva, the auspicious and Bhairava, the terrible. Although he represents Tamas, he is considered the purest (shivam). He is a householder, who lives an austere life like an ascetic. He is found not only in Kailash, the highest and the purest abode but also in the cremation grounds, which are considered one of the most impure places. Therefore, you cannot easily categorize him into conventional stereotypes. He combines with himself a wide array of qualities, ranging from the darkest to the purest, as if to challenge our conventional norms and question our judgment or our egoistic notions of morality and immorality or right or wrong. The wise ones who meditate upon him know that he is the meeting ground of all the dualities and contradictions and worship him, suspending their judgment and worldly notions of good and evil. He is the ocean in whom all diversity comes to rest. The opposites of life arise from him and dissolve in him. The Vedas also portray the contradictory and composite aspects of his personality. They describe him as the harbinger of death who is responsible for miscarriages and the death of cattle and humans because of snakebites, etc. At the same time, they also extol him as a divine healer who brings healing medicines for the sick. As the fierce god of storms, he unleashes the Rudras and Maruts to churn the sky and cause rains and floods. Shiva also personifies sameness and equality. Since he is equal to all and shows no favors or distinction, he is worshipped equally by gods, demons and humans. One may worship him both ritually or spiritually, and conventionally or unconventionally. One may also worship him directly or with the help of a priest. During worship, you may offer him water or milk or a simple prayer. He accepts them all and rewards his devotees according to their merit. Although he is easy to please and rewards the righteous, he punishes the wicked ones.